Many cite the popular minimalist refrain - less is more. And what better example than the small gesture. 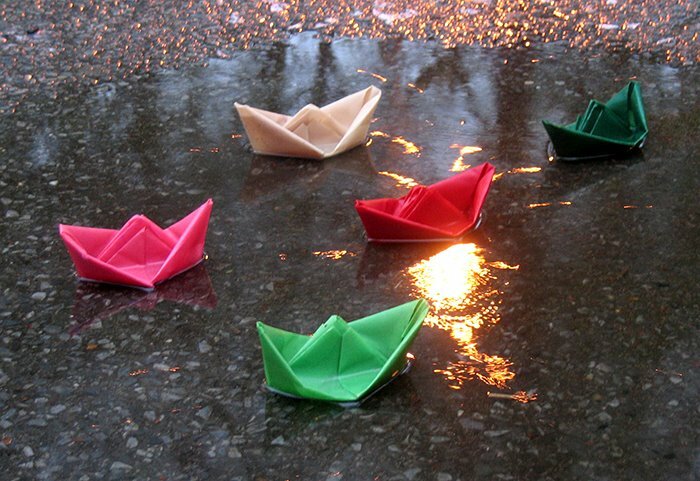 These colorful origami boats in a puddle in yesterday's rain were the small gesture of an unknown hand. They garnered quite a bit of attention, as many of us circumnavigated their small ocean and observed them from many vantage points. I don't like a rainy day. Until I have surrendered to the rain. Then I find it quite relaxing. When the mind is in the spirit of surrender and no longer rebels against the elements, you can fully embrace the rainy day. The sunny day is a distant memory and you can enjoy the impressions that a rainy day brings. Like a child who does not need to go to school on a snowy day, a rainy day gives permission to play and indulge in the small things we often miss or forget. This opportunity can be for a pause for reflection - a welcome moment of respite for the weary New Yorker. I photographed in the rain with a friend until we were quite wet - few will make the effort at times like this when the weather is so dreadful. But this is when one can capture some very unique images.